Aseptic processes are becoming increasingly important for handling sensitive products in the pharmaceutical, biotech and food industries. 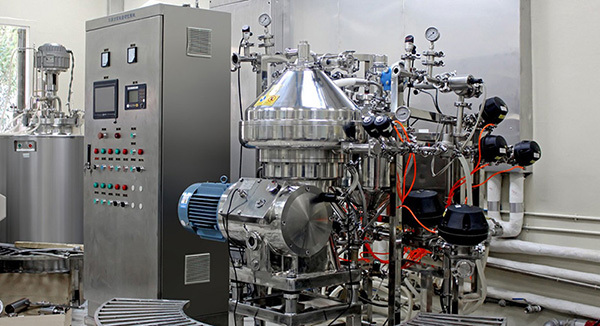 This is applicable for instance for the separation of proteins from fermentation solutions for pharmaceutical products, processing genetically modified micro-organisms or manufacturing starter cultures in the food and pharmaceutical industries, production of vaccines or the processing of genetically modified organisms. Phase separation by means of centrifugal force in a separator is a key aspect in the process involved. And this important step in the process must also take place under sterile conditions. This means that the entire separator system must be steam-sterilizable. All plant components such as fermenters and receiving tanks for the separated components are connected aseptically to the system. Huading Separator has developed the clarifier BTSX-M series in steam-sterilizable design (SIP) specifically for these fields of application which has an hourly throughput capacity of 100 to 10,000 liters based on E-Coli. The new disk type separator is suitable for the continuous clarification of suspensions, separating bacteria, mammalian cells, cell fragments and yeast under sterile conditions. The complete separator is steam-sterilizable. The machine is sterilized at rotate using superheated steam at overpressure of 2.5 bar and a maximum possible temperature of 137 °C. After sterilization, the separator is blanketed with sterile air, which also cools down the machine, until the next product run. Sterilization avoids cross-contamination between different fermentation products which are treated in the same separator. Chemical cleaning in place (CIP) is carried out before the sterilization process (SIP). 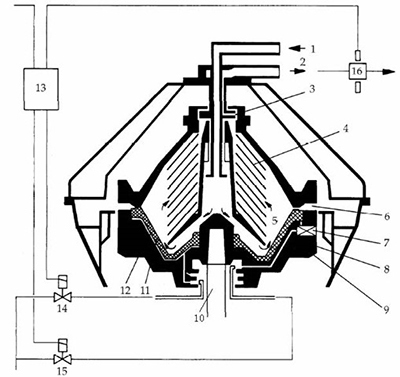 Cleaning liquid is circulated through the separator and the connected system. A further aspect in the recovery of proteins in the separator is just as important as the prevention of product contamination: the guarantee of biocontainment. Therefore, Huading Separator offers the BTSX-M in steam-sterilizable design as an absolutely enclosed machine and plant concept which prevents toxic bacteria or living cell vaccines from escaping into the atmosphere. The product is separated into solids and clarified liquid in the disk stack and discharged foam-free and under pressure by centripetal pumps. The solids accumulate in the solids holding space and are instantaneously ejected at periodic intervals and collected in the solids tank. The solids can be further transported from the solids tank by means of pumps. The BTSX-M series is equipped with a metering piston which permits precise preselectable and reproducible ejections. A twin-action slide ring packing reliably separates the drive chamber from the chamber which comes into contact with the product so that possible contamination of the product by motor and gear are excluded. The required drive power for the type BTSX-M separator is transmitted by a three phase AC motor via a flat belt or gear worm direct onto the bowl spindle. The advantage of the flat belt drive is the reduced maintenance requirement and hence higher availability and less downtime. The hood as well as the solids collector are in two-wall design to cool the recovered proteins. A major advantage of using the BTSX-M separator in these demanding processes is the high degree of automation. Irrespective of whether the separators are used as a stand-alone insular control facility or are incorporated in a master process control system – different recipes, ejection intervals, the biomass harvest as well as the SIP and CIP phases can be carried out in a reproducible and error-free manner at the push of a button. Recovery of biomass, such as E-Coli, inclusion bodies and mammalian cells starter cultures, such as lactic acid bacteria, fermentation broth and enzymes treatment of genetically engineered microorganisms and vaccines. – Precisely controlled partial and full solids ejections, which reduces the solids ejection time to less than 1/10 of a second and results in an increase in cake dryness.